Ever since I made this pretty little felted purse for my daughter, I have been wanting to make a felted bag for myself. So I headed to my local yarn store and bought some yummy wool yarn. 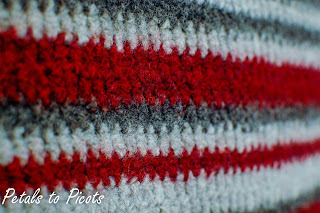 You can work up this bag all in one color or use a few colors to make a random stripe pattern as I have done here. Before felting, bag measures approximately 15 in. high and 14½ in. wide, with 38 in. straps. Round 1: Work 4 dc in 4th chain from hook, 1 dc in each of the next 35 ch, 5 dc in last; working on opposite side of chain, 1 dc in each of the next 35 ch, join — 80 sts. Round 2: Ch 3 (counts as st), work 2 dc in each of the next 3 sts, 1 dc in each of the next 37 sts, 2 dc in each of the next 3 sts, 1 dc in each of the next 37 sts, join — 86 sts. Round 3: Ch 3 (counts as st), work 1 dc in next, 2 dc in each of the next 4 sts, 1 dc in next 39 sts, 2 dc in each of the next 4 sts, 1 dc in next 37 sts, join — 94 sts. Round 4: Ch 3 (counts as dc), work 1 dc in next st and each st around, join — 94 sts. Rounds 5 through 27: Repeat Round 4. Round 28: Ch 1 (does not count as st), work 1 sc in same st as join and each st around, join — 94 sts. Row 1: Work 1 sc in 2nd ch from hook and each ch across, turn — 120 sts. Rows 2 through 5: Ch 1 (does not count as st), work 1 sc in each st across, turn — 120 sts. Round 1: Work 1 sc in 20th ch from hook and each of the next 8 ch, 3 sc in last ch; working along opposite side of ch, work 1 sc in each of the next 9 ch, work 33 sc in loop, 1 sc in next 9 sts, Sl st to join. Next, felt the pieces using one of the methods described in Felting Knitting & Crochet. I prefer to leave the pieces unattached until after felting because I feel like it gives me more control in shaping the pieces. I just love how the stitches look after they are felted! 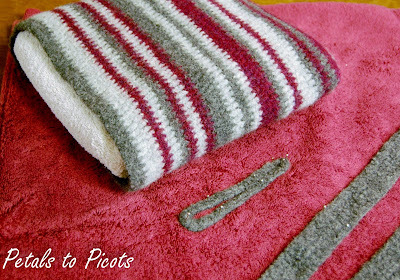 Once you’ve felted the pieces and gotten the excess water out, shape them as desired. I stuffed the purse with a folded towel and pinned the straps and closure to a towel to block them into shape. You can find my free tutorial on Felting Knitting & Crochet. Allow to dry. Once dry, sew on your straps and closure as shown. If desired, you can also line your bag with fabric. I LOVE this felted bag. Could you please tell me how many yards of wool are required? I cannot wait to make some!!! So glad you like it, Anne 🙂 I used 1 hank each color of Cascade 220 yarn. Thanks Kara! I’d like to use some yarn in my stash. Just so I have it right, you used approximately 660 yards of yarn (3×220 yards). Is that correct, please? This bag is awesome! I have many OSU buckeye fans on my gift giving list….this would be perfect for them! IS THIS DONE IN THE ROUND? Hi, Could you give the finished measurements after felting? I am ready to start this bag, it will be my second felting project. Hello 🙂 Mine came out to about 11 in x 13 after felting but your results may differ depending on type of yarn and how much the piece is felted. Hope that helps! What was the total yardage for the bag? Thanks. Hi Susan 🙂 I don’t know the exact yardage … I bought 3 skeins of Cascade 220 (1 in each color) and definitely had a bunch leftover. Hope that helps a little. Thank you for this pattern. I worked it up for a friend in Cascade 220 in two jewel tones and used a large Nordic button as the closure. It’s just beautiful and the friend I made it for is delighted. I’ll be sure to give you full credits when I blog it. Thanks again. It sounds beautiful!! I can’t wait to see it! Thank you so much for the great pattern. I did it! And I love how it turned out. I’ve already picked out some wool for another one. I have pics on my blog with a link back to you. What a great idea and such a lovely pattern! I featured the bag on my blog this morning at http://whittskitsfabricscrafts.blogspot.com/2013/04/find-it-free-on-friday-totesbags.html and linked directly back to here. Love the colors you used, Kara! This is very nice. 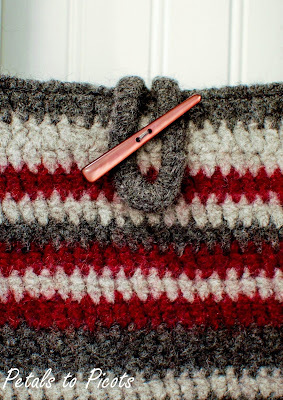 I have yet to crochet and then felt – I’ve gotta use your tutorials and get on that! Thanks for sharing at Hookin On Hump Day! Beautiful color scheme. I haven’t tried felting yet. Lovely. Very pretty, Kara! Lovely AND useful! My favorite kind of projects! 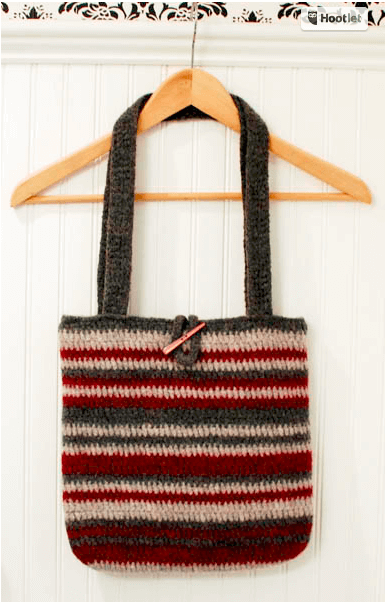 I’ve knitted/felted a number of bags but I have never done this with crochet… but I am now! Thanks for this great tutorial! This is so pretty. Felting is definitely on my (too large) list of things to try. Thank you for sharing. Your patterns that I have purchased have all turned out well. Now I may have to learn to felt. Lovely bag! Thanks for the tutorial.